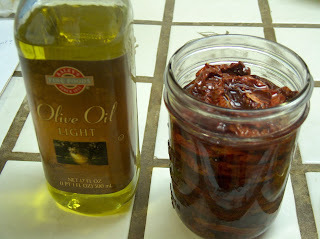 After my last post, I got a couple questions about how to make your own marinated dried tomatoes. They're simple to do, and give you such a great, flavor-filled reminder of homegrown tomatoes throughout the year. First step is to dry the tomatoes. You can do this in the oven on low heat (200 degrees) on a foil-covered pan for anywhere from nine to ?maybe 24 hours? The length of time depends on how big and how juicy your tomatoes are. You want them to end up the texture of raisins, with all the moisture sucked out of them. Here they are, getting there. The two in the upper right corner look about done. If you're fortunate enough to have access to a dehydrator (big thanks to my friend Angie for lending me hers this summer), you can use that to do the drying. 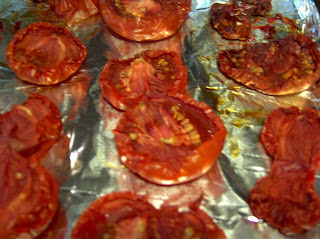 It still takes quite a while -- maybe 24 hours or even longer, depending again on the tomatoes' size and juiciness -- but if you set up the dehydrator on a deck or in the garage, you won't be heating up your house throughout August and September. What you end up with are flat little discs of tomato goodness that will be way smaller than the slices you started with. Once you're done snacking -- and you will want to snack on a few -- grab a jar. I like to use wide-mouth pints. The wider mouth makes it easier to get your hand in there, and I think the pint is just a nice size. No offense, you quart jars, or cute little eensy jars. Pack the tomato slices pretty tightly in the jar and cover completely with olive oil. No part of the tomato should stick out; the oil is what preserves them. In the picture above, I still need to top off the jar with another inch of oil before closing 'er up. Any little bits of tomato sticking out must be jabbed down until they're fully immersed (and staying) or else removed from the jar. If you leave any part of the tomato out of the oil, it will get moldy and you'll have to throw out the batch. These should keep just fine in your pantry throughout the winter. I like to keep a couple on the window ledge above my kitchen sink. They make me smile. 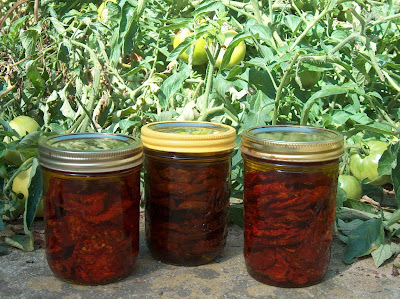 As for The Prudent Homemaker's question about how many homemade dried tomatoes to use for the cheese ball recipe, I just eyeballed it based on a store-bought jar of roasted peppers I had in my fridge -- I'd say I used maybe 12-15 of the marinated, dried slices. And that's probably way more than you really wanted to know about marinated dried tomatoes. Have a nice day. Wow! I had no idea it was that easy to dry and pack tomatoes. I should start doing this with the left over tomatoes we buy at the store instead of throwing them out. Do you think it would work with store bought ones? Libby, I've never tried this with store-bought tomatoes, but don't see why it wouldn't work, especially if the tomatoes you're buying are pretty flavorful. I have tended to avoid most store-bought tomatoes in recent years because I've gotten so spoiled by the taste of the ones we grow. But I'd love to hear if you try it, and what you think. Do you have to do the boil/sterilize the jar thing? I'm always convinced I'm going to end up on the 5:00 news having killed my family with botulism. 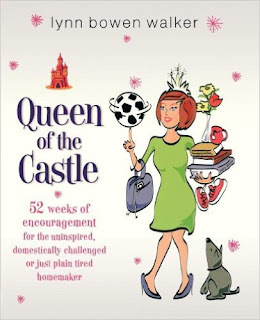 Carpool Queen, I've never sterilized or boiled for this. You just need to make sure that all parts of your tomatoes are fully submerged in the oil. (And if they're not, you will know it when you open the jar, as the parts above oil will be moldy. That's when you know you've gotta throw out the batch.) Also be aware that this method preserves the dried tomatoes, but isn't meant to keep them indefinitely. So I use mine up within the year. I read a great book this summer called Keeping Food Fresh: Old World Techniques and Recipes by The Gardeners and Farmers of Terre Vivante. It has chapters on preserving foods in oil, preserving in vinegar, preserving in alcohol, drying foods, etc. Basically, all the ways people have been preserving foods throughout the centuries before canning and freezing existed. I'd highly recommend it, if you have questions or are considering trying stuff like this but aren't sure. And if all this makes you too nervous, you can always dry the tomatoes, bag them up in a Ziploc and throw them in the freezer. Then before you want to use them, you could rehydrate in oil, maybe for a day or so (and store in the fridge, if you want). how fun! i bet they're so sweet and chewy, i'd love to try this! I wish I still had fresh tomatoes, I would definitely make this! 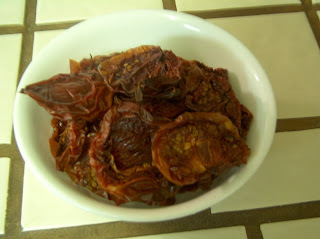 I love dried sun-dried tomatoes and I bet the taste is similar! Lynn- I so am in awe of these tomatoes. That is one big undertaking. Girl you are rollin' in tomatoes! I wanted to do this years ago and I still have not done it. Bravo to you! Hope you'll tell more of how you use them Ms. Lynn! 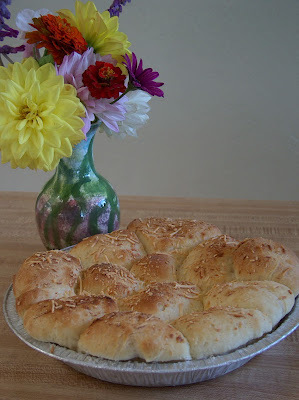 I use them in the cheese ball recipe posted directly below. I haven't yet put them on homemade pizza (we've been using our fresh tomatoes for that), but I plan to do that next. I think they'd also be great in a quiche, either as the main ingredient or as extra flavoring in quiche made with chicken, for example. What a great idea! I can jams, jellies, and fruit all the time, but acidic tomatoes have scared me off. These look nice and easy (and delicious)! And I think I'll have to check out that book! Of course I won't be able to do this until next year, but that's okay. I've got plenty to do right now!